One of the more popular towns in the South of Bali, Seminyak is known to be a stylish and upscale beach resort area. Also known for it's nightlife, beaches and shopping! It's the perfect location to wrap up your last few nights in Bali. Also a great spot to anchor if you're looking to take a day trip to an island. In Ubud, you don’t need to stay directly downtown. In Seminyak, I highly suggest it. Since Seminyak is such a lively town (and we were ready to party), we wanted to be able to walk to all the restaurants, bars and shops. We booked this incredible villa that was just a 5 minute walk to the main street. Seminyak IS known for it's luxurious resorts, so that's certainly something to look into if that's the vibe you're going for. Especially if it's just 2 of you as you only need 1 room! However if you're like us and traveling with 3+ people, a roomy villa makes more sense. This one checked all the above boxes and then some. Oh and the outdoor shower, gotta have an outdoor shower experience in Bali. SPEND AN ENTIRE DAY HERE! Trust me, we wish we did. Get here early so you can snag a cabana, and have nothing else on your agenda for the day but to relax, eat and drink. With an infinity pool looking out to the ocean and a swim up bar for lazy refills, you’ll never want to leave. 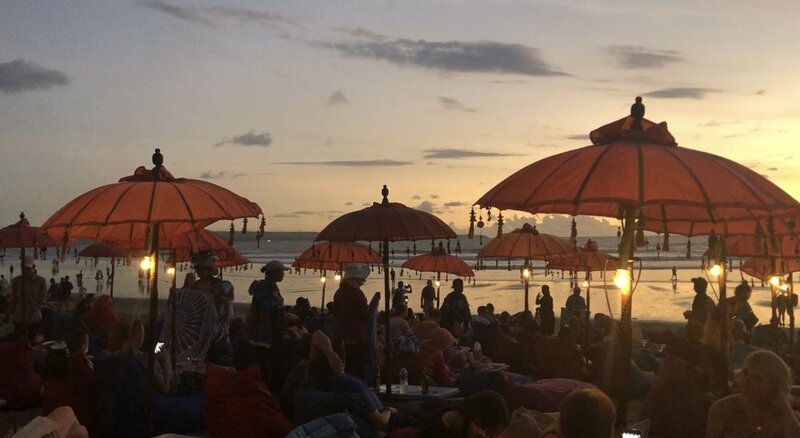 Plop down on a colorful bean bag, order a drink & some guac, and take in one of Seminyak's infamous sunsets. Here you'll have a lot of "beach vendors" walking around offering services. I got my hair braided for $5 and a 20 minute neck massage for another $5. WHILE SIPPING A MARGARITA. Café Organic is a vegetarian café offering a huge variety of health conscious dishes in an insanely instagram’mable ambiance. It’s every bloggers dream. 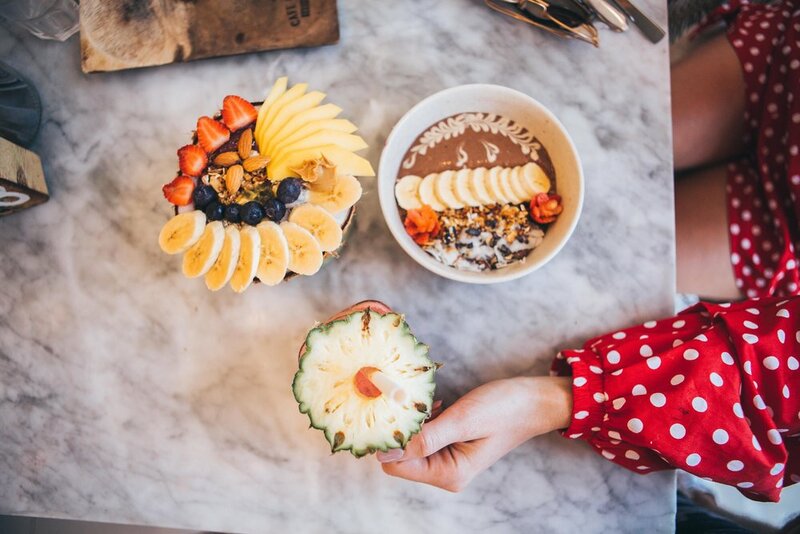 Whether you go for an acai bowl, fresh salad, or the avocado toast… you’ll be extremely impressed with the taste, quality and display. Peak the menu here before you go. 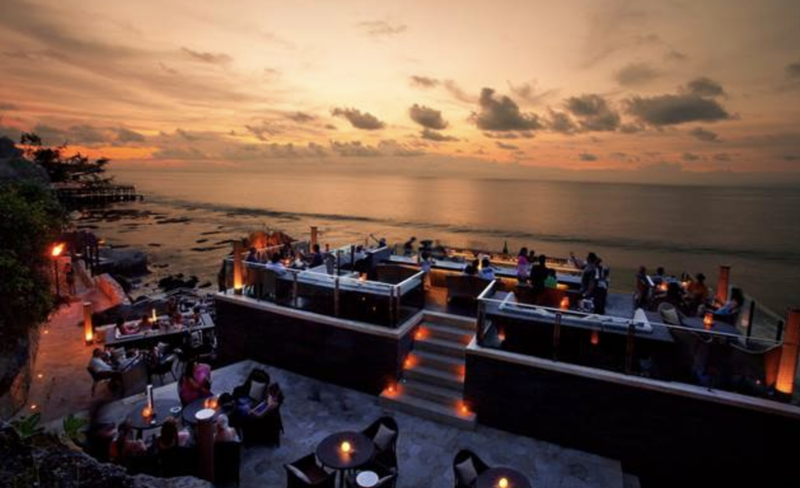 OK Rockbar is a bar on a cliff (casual) overlooking the ocean. It’s located at the Ayana Resort about 30-40 minutes South of Seminyak. Unfortunately due to running out of time, we didn’t actually make it here. BUT it was the most highly recommended place to go for Happy Hour so don’t pass this up! NOTE: Get here early! We were told to arrive about 2 hours before sunset to avoid long entry lines. Ok I know, I know. I'm not a fan of nightclubs either... but this one is also a restaurant at normal hours and it's SO COOL. Jungle'ish vibes you know? V Bali. Anywhere that has a photo-booth with props, great tequila drinks and a DJ that spins the occasional Spice Girls song... I'm a fan. We came here our last 2 nights! Come here thirsty and ready to dance. Nusa Penida is an island Southeast of Bali. Here you will find genuinely breathtaking views and infamous locations such as Angel's Billabong, Broken Beach and Kelingking Beach. The entire coast is lined with some of the most stunning beaches in the world. We only spent a day here which was plenty for us, but there are resorts on the island if you want to take your time here and explore everything Nusa Penida has to offer. I highly suggest booking this trip through a tour guide! We used "Bali Tour Services" and their email is kedit79@gmail.com // @localbalidriver . a private driver/ tour guide on the island to take you around to 4-5 points of interest on the island. Honestly if we didn't have the driver, IDK how the hell we would have figured out how to get to these spots. For example, Broken Beach is about an hour drive from the ferry location and it's a ROUGH RIDE up very rocky, winding roads. Lauren and I couldn't stop laughing because it was almost a joke how bumpy it was, but the views are so worth it. Don't even bother with a scooter! Like I said, these roads are rough. It'll be extremely uncomfortable and take you an unnecessary amount of time. WEAR SUNSCREEN, Bali sun is NO joke and you'll be exposed almost all day. The ferry ride over is about 35 minutes. It's not glamorous but it gets you from A to B. Angels Billabong // Natures infinity pool. Same spot as the Kelingking Beach view stop. Fresh coconuts at one of their many beaches. I'm going to wrap it up with a little exchange I had with our driver on one of our last days here. His rearview mirror was faced completely down, aka useless. When I pointed this out to him, I said "hey your rearview mirror- do you not use it?" He replied "why? to look back? I'm not going that way! "As if it were a silly question.